The original Interrogator is one of the gems of the latter years of the Real American Hero era. He had all the hallmarks of what made the early Cobra agents interesting and menacing. Though he was a driver of one of the most ridiculous GI Joe vehicles, the figure was wonderful. Mysterious, imposing and well designed, he was a favorite of the 90s. Hailing from one of the last multi packs (VIper Lockdown) of the relaunch years, Interrogator was a welcome surprise when he was released. Made up mostly of parts from the DTC Crimson Guard, the figure is a fairly close approximation of his classic iteration. I’m still amazed at the attention to detail on the new web gear, with its brass knuckles and working holster. I think the newly sculpted head would work as-is on a modern update of the character. As cool as the figure is, my one simple question- if someone’s specialty is interrogating prisoners, how wise is it to go into an interrogation session where you’re about to put a prisoner through complete Hell, and here you are with bright silver grenades, brass knuckles and an open holster strapped to your chest? Was this guy really so certain he had his prisoners completely broken? Am I reading too much into a toy? Is it just me in thinking that it looks like he has 2 helmets stacked on his head? @Vaughn Allan maybe there is a special hook for his bandoliers outside the interrogation room? The entire era this fella hails from is a distinctly grey area in my knowledge, so maybe I’m missing something regarding the possible double helmet designs and other prevalent fashions of the day. That said, the stripes on the pant-legs and jacket combo are rather dapper, I suppose. 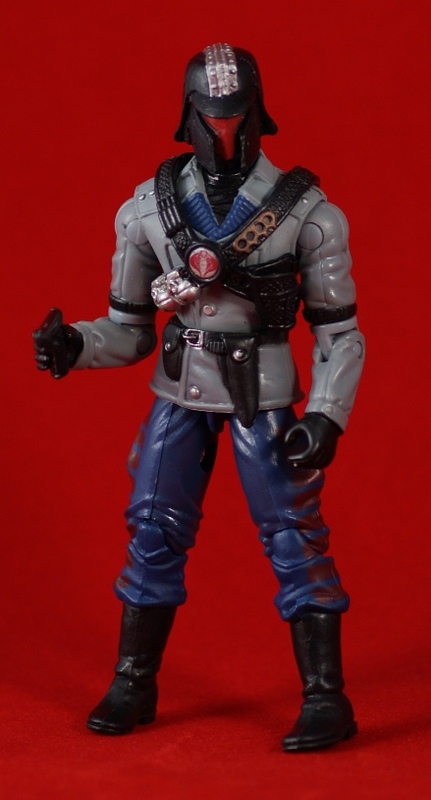 For me, Interrogator is one of those fascinating characters from the classic toy line that really fits in my collection to keep things more based in imagination as there isn’t a large cartoon or comic influence (at least one that hasn’t influenced me at all). On this Interrogator I just wasn’t feeling it, though. He’s got a heavy fancy trench coat feel, not unlike Mindbender in a lab coat. It’s a fine re-use of parts, and the new stuff is just fine, but this figure shows how there was no real drive to push into a new area for this figure, and the 2010 figure just doesn’t flow with that mix of parts. It’s good for what was available, I guess. I guess the 1991 figure, with it’s rather tall and athletic figure feel, with the somewhat ceremonial flair mixed with a little spiked metal and brass knuckle flair, gives me that refined psycho path image. It’s like he’s professional looking, but makes breaking people a profession, and seems like he wouldn’t break a sweat doing it. If you think about it, The Interrogator’s mentioned on the back of Serpentor’s filecard. 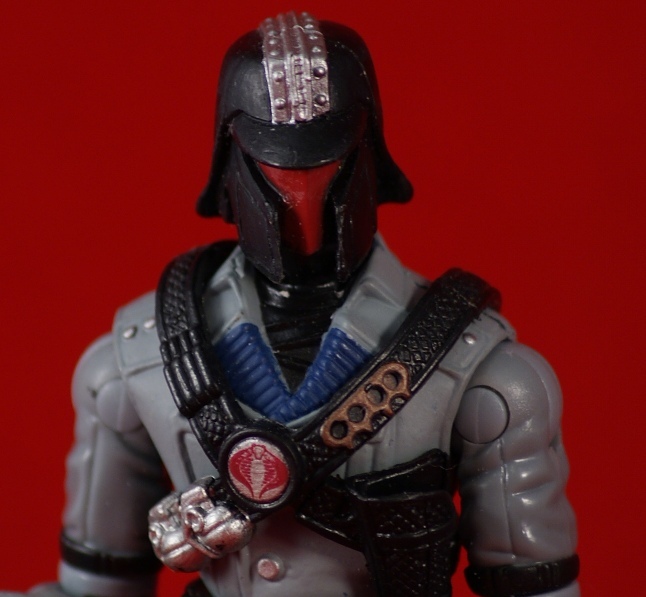 Joe mythos pertains that it was an original working name for Mindbender but you could picture this guy as being part of the cabal who decided to create Cobra’s most divisive member – Serpentor – especially among the fandom…. Wasn’t Overlord supposed to actually be a Cobra Commander design anyhow? Am sure I read that somewhere…. *scratches head*….